Are you looking for a fun-to-drive midsize sedan? The 2018 Mazda6 will check all the boxes. Tailor-made for the driver who wants to have a little fun on the way to work, the sporty Mazda6 is the perfect combination of horsepower-driven thrills, family-friendly interior, athletic style and affordability. Learn more about the Mazda6 in this 2018 Mazda6 vs 2019 Honda Accord comparison that pits the Mazda midsize sedan against a top-tier competitor. An athletic style and class-above luxury are hallmarks of the 2018 Mazda6 spec sheet that provides drivers with five trim levels to choose from – Sport, Touring, Grand Touring, Grand Touring Reserve and Signature. With room for five passengers in a well-equipped cabin that provides 99.7 cubic feet of passenger space and adds 14.7 cubic feet of trunk space, the Mazda6 is a well-rounded option for your next family adventure. 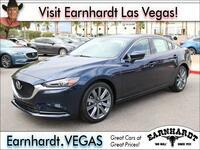 What Are the Differences Between the Mazda6 and Honda Accord? 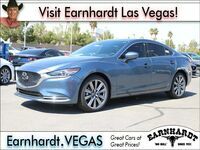 Price is an important aspect of the car-buying process that stands out in this 2018 Mazda6 vs 2019 Honda Accord comparison. With a price tag that starts at just $21,950, the Mazda6 is a more affordable option than its Honda counterpart and comes complete with a long list of standard features. Base Mazda6 Sport trim levels feature 17-inch wheels, LED headlights, push-button start, dual-zone automatic climate control, a rearview camera, Blind Spot Monitoring with Rear Cross Traffic Alert, Smart City Brake Support and an 8-inch MAZDA CONNECT™ touchscreen infotainment system with Bluetooth. 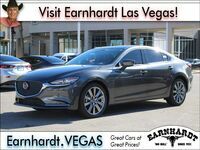 An upgrade to Mazda6 Grand Touring Reserve and Signature trim levels will provide drivers with an elite level of luxury and class that will surpass many competitors. Grand Touring Reserve trim levels add LED headlights, a heated steering wheel, premium leather upholstery, heated front and rear seats, ventilated front seats, an Active Driving Display, an 11-speaker Bose® sound system and more. 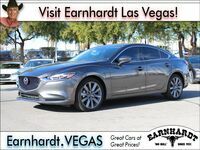 Top-of-the-line Mazda6 Signature trims employ a gunmetal grille, microfiber suede and wood interior accents, a premium leather interior, a digital instrument display, front and rear parking sensors and a 360-degree camera system. Under the hood, the 2018 Mazda6 promises the perfect combination of excitement and efficiency that starts with a standard 187-horsepower 2.5-liter SKYACTIV®-G four-cylinder engine. Married to your choice between a six-speed SKYACTIV®-MT manual transmission and a six-speed SKAYCTIV®-Drive automatic transmission, the Mazda6 will achieve 26 mpg in the city and 35 mpg on the highway with the automatic gearbox. Honda Accord entries counter with a 192-horsepower 1.5-liter turbocharged four-cylinder engine paired with a Continuously Variable Transmission. To take performance to the next level Mazda6 Grand Touring, Grand Touring Reserve and Signature trim levels will upgrade to a 250-horsepower 2.5-liter SKYACTIV®-G turbocharged four-cylinder engine that makes 310 pound-feet of torque. 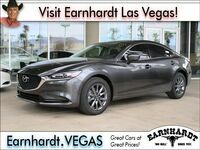 Paired with a six-speed SKYACTIV®-Drive automatic transmission, the turbocharged Mazda6 will make 23 mpg in the city and 31 mpg on the highway. The Honda Accord upgrades performance with a similar 250-horsepower 2.0-liter turbocharged four-cylinder engine. 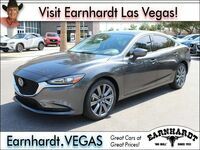 Visit Earnhardt Mazda Las Vegas today to get behind the wheel of the 2018 Mazda6!